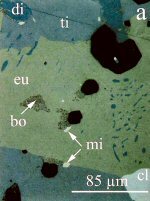 Comments: Polished section image of milotaite (mi) which occurs as subhedral, minute inclusions in eucairite (eu)-tiemannite(ti). bo (bornite), di (selenian digenite), (CanMin, v43:689). Location: Predborice, Czech Republic. Scale: See Image. Comments: Mimetite crystals are replaced by Duftite-alpha on a gossanous matrix. Location: Mt. Bonnie Mine, Northern Territory, Australia. Scale: Crystal size to 3mm. Comments: Crystals of tan colored Mimetite. The largest crystal is 1 cm across. Location: Mt. Bonnie Mine, Northen Territory, Austalia. Scale: 2.9 x 1.7 cm. Comments: White, fuzzy aggregates of plumbogummite covering lime green mimetite (campylite) crystals. Location: Caldbeck Fells, Cumbria, England. Scale: Not Given. Comments: SEM image of spherical aggregate of growth-zoned minasgeraisite crystals showing elongation along a and simple pedion termination. (AmMin, v71:603). Location: Lawa de Sr. Jose Pinto pegmatite body, Jaguaracu, Municipo de Timoteo, Minas Gerais, Brazil. Scale: Tick Marks 10 µm. Comments: White pearly crystalline minehillite with white margarosanite and dark gray lead, in pale pink opaque wollastonite (distinguished by blue-white fluorescence). Comments: Bright orange minium with curved, conchoidal surfaces. Location: Santa Fé Mine, Bolaños, Mun. de Bolaños, Jalisco, Mexico. Scale: 33x22x14 mm. Comments: Greenish-gray dull minnesotaite masses in iron ore matrix. Location: Virginia, Saint Louis County, Minnesota, USA. Scale: See Photo. Comments: Crystals of minyulite on matrix. Location: St. John's Quarry, Kapunda, South Australia. Scale: Crystal size 4-5 mm to 5 mm. Comments: White, blocky aldermanite crystals to 2mm completely covering one face of matrix with colorless prismatic Minyulite crystals in sprays to 3mm. Location: Tom's Phosphate quarry, Kapunda, South Australia, Australia. Scale: Overall: 2 x 1.5 x 2 cm. Comments: Colorless grains and indistinct crystals of mirabilite. The mineral dehydrates quickly in dry air and must be preserved in a closed box. Location: Willi Agatz Mine, Dresden, Saxony, Germany. Scale: Picture size 4 mm.